Christmas happens as a whole season for me (all 12 days) and so does Easter: I celebrate spring on the equinox, observe Lent haphazardly, throw myself 100% into my family’s beloved Easter traditions (we take egg decorating very seriously), and I celebrate Passover by myself. To me, this is all part of the same holiday, and not just because they happen to overlap on the calendar. This year Passover happened to fall on the same day I was having little kids over to color eggs, so I ended up sharing it, which was really nice. I had learned how to hold a Seder dinner back in grad school. Our Jewish housemates and friends couldn’t usually go home for Passover so we had big potluck Seders at our house. One year, after several people had graduated and gotten fellowships elsewhere, we looked around the table and realized there were no Jewish people at our Seder at all! I had to read the Hebrew parts of the service, which was pretty hilarious, since I am barely literate in Hebrew (like, really not). But I guess that was when I first felt like I was celebrating my holiday rather than being a guest at someone else’s. I certainly never do a whole Seder service all by myself! It would be impossible anyway, since the whole thing is organized around a series of question-and-answers between children and their elders. And not all of it speaks to me. But some of it speaks too loudly for me to ignore. 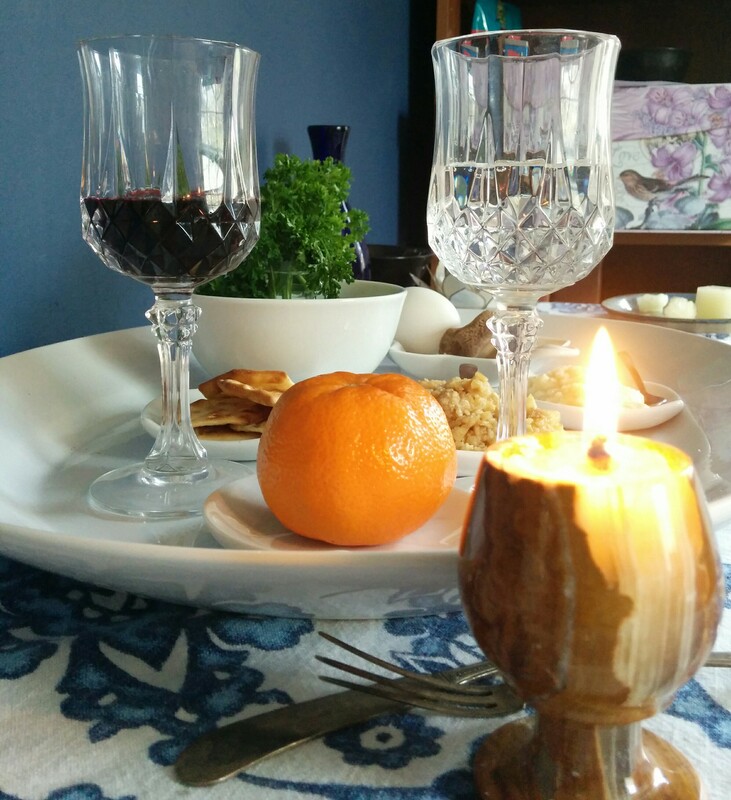 This year for the first time there were children with questions, so rather than telling the whole Passover story (which is kind of scary in the middle), I just explained each thing on the Seder plate and let them taste the ones they were willing to try. The things on the plate tell a story. The bone is because the story is very old. The egg is because the story is about a new beginning. The parsley with salt water is because the story is happy and sad both. It’s a story about when the Jewish people were slaves in Egypt, but in the end they get away. They had to take clay mud and make bricks, and then make the bricks into buildings. The charoset is for the clay. But the Jewish people were very unhappy about being slaves: that’s the horseradish. If you eat it, it will make you cry. Whether we see ourselves as the Hebrews or the Egyptians, when our society is based on political and economic injustice, every triumph of our civilization holds bitterness as well. When the Jews finally had a chance to escape, they had to go very quickly and they didn’t have time to make any bread for the journey. They only had time to make crackers. It’s important to always be ready for a big change. The little kids were very happy eating charoset and crackers, which is pretty much the ideal children’s snack, but one little brave girl actually tried eating some with horseradish. At that point we skipped straight to the orange before her face exploded. The orange is for including everyone. A grownup friend asked about the last two items: Elijah’s glass of wine and Miriam’s glass of water. In the Jewish traditions, these are complicated and beautiful layers of the story. My front door is always open for Elijah; if I’m not at home, the key is on the porch and he’s welcome to let himself in anytime. And I love Miriam’s magic well, which followed her everywhere while the Jews wandered so many years in the desert. We think of miracles as particular and unusual, but perhaps they follow us everywhere, and if we can see them, we will find we already have what we need. Later that night I did the part where you spill drops of wine for each of the terrible plagues and curses. This, to me, is the hardest part: to look clearly at all the ways our own happiness may come at the price of someone else’s suffering. Everyday things – my cute skirts from India; the gas in my car. And life-changing things: the whole concept of adoption, obviously; every person I’ve loved that I had to let go. A couple of weeks before Passover I started thinking about the Sheheckeyanu, the only part of the Hebrew blessings I retained. It’s a prayer of joy and gratitude. After a couple of years of wrestling hard with loss and disappointment, I (very suddenly) started to feel how much I had to be grateful for. I knew that all along, of course – that I also had a lot to be grateful for – but that’s different from really feeling it. Dear friends, no matter what you believe or don’t believe, sometimes such terrible things happen that you feel as if you are being punished for something. May all such things pass right on by your door. May we be ready for changes when they come. May we find the courage to rejoice even when our joys are mixed with sorrows, and may we all walk away free from whatever has us enslaved.